By Rup Narayan Dhakal—Pokhara: As it comes the name of Pokhara, it closely relates to mountains and lakes. Situated some 200 km west of Kathmandu, Pokhara offers stunning views of Annapurna ranges including several other beautiful snowcapped peaks. If you are in Pokhara, you could not miss the views of mountain beauty that directly comes to your eyes whether you wish to see or even not especially in the months of October, November and December. Crystal clear mountain views also could be witnessed in the months of March, April and May. The mountains can occasionally blanked inside cloud for many days, particularly during the season of monsoon. When the mountains smile with clear view, the season of travel to Pokhara is supposed to begin. Pokhara is also famous for close view of high mountains as dozens of them are not far than 33 km of aerial distance from this city. The eight of 14 highest mountains fall in Nepal and three of them are visible from touristy town Pokhara. Mt Annapurna (8091m), Mt. Dhaulagiri (8,167m) and Mt. Manaslu (8163m) could be seen from Pokhara. An International Mountain Museum also has been established in Pokhara to explore those including other mountains and mountain activities in Pokhara. Mt Annapurna is one of those mountains and it was first scaled in the history of eight-thousander in the world. June 3, 1950 was the day that French nationals Maurice Herzog and Louis Lachenal had stood atop Mt. Annapurna, three year earlier of the successful ascent in Mt. Everest, the highest peak in the world. So, Mt Annapurna had made the history of eldest peak and of successful victory over the peaks above 8000 meter in the world. Besides Mt Annapurna, the long array of mountains from Dhulagiri in the west to Ganesh Himal in the east could be viewed from Pokhara and from its surroundings. Moditse, Annapurna South, Hiunchuli, Tharpu Chuli (Tent Peak), Gandharba Chuli, Annapurna I, Tarke Kang, Khangsar Khang, Gangapurna, Mardi Himal, Nilgiri, Machhapuchhre (Fishtail), Annapurna III, Annapurna IV, Annapurna II, Lamjung Himal, Himalung, Harka Chuli and Buddha Himal are some of the mountains that are situated in the northern part of Pokhara. Most of the above mentioned mountains could be observed from Pokhara however more mountains could be seen as we ascend hillsides in and around Pokhara. Sarangkot, Foxing, Mattikhan and Dhampus are some of the best places to see the magnificent mountain ranges. Damside of Pokhara is popular point to take pictures of Annapurna Massif and its reflection in tranquil Phewa Lake. Visitors also enjoy mountain flights, heli-ride, ultra light flights, paragliding and zipflyer to see the mountains from very close distance. Green forests, beautiful lakes, serpentine rivers and typical human settlement also could be seen from such means of adventure as Pokhara is also known as the destination of adventure tourism. The interesting part about the mountains is that they change their color as per the season and the time of the day. We could see the milk-like view of mountains in the months of August and September. The mountains seem like copper when the morning rays of sun kiss them but the view changes into silver in mid-day. The view seems like vermilion when the time of sunset. In this connection, Mt. Fishtail which is popularly known as Machhapuchhre in Nepal is also a sacred peak and is worshiped as goddess and only virgin peak in Nepal. So, this crafted peak is not allowed for mountaineering. The peak is known as one of the most beautiful ones in the world. The Fishtail has two peaks that sound a tail of fish. Another beautiful mountain Annapurna means the pile of food grains in Sanskrit and is worshiped during the time of rice harvesting in Nepal. Those all mountains have played vital role to make Pokhara a prominent tourist destination of Nepal for domestic and international tourists. Mountain related posters, the photographs related to those mountains and mountaineering activities on those mountains have very important role to make Pokhara a popular tourist destination. Film shooting and photography on the backdrop of that spectacular Annapurna Massif also have been playing positive role to promote Pokhara. 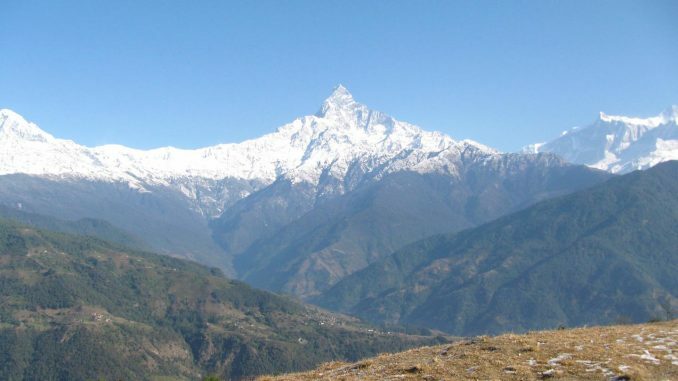 Pokhara is also a gateway to the world famous Annapurna Region and Dhaulagiri Area. As Annapurna was climbed by Herzog and Lachenal the whole Annapurna Region and Pokhara became very popular. As Herzog wrote a book named Annapurnas, covering his expedition experiences helped the area to get international recognition. Later, during the time of sixties, as Col. Jimmy Roberts who explored many trekking routes in Annapurna Region also helped Nepali mountains to make popular in the world. Earlier, in 1899, Japanese Buddhist Monk Ekai Kawaguchi had visited Nepal and he later reached Mustang to Tibet via Pokhara. So Kawaguchi is also remained helpful to make this area popular. Swiss geologist Tony Hagen, who travelled 14,000 km across Nepal, had also said that Pokhara is one of the most beautiful cities in the world. He played very important role to promote Nepal to the outside world in 1960s.